It's the tenth month of the year 2013 already! Have you fulfilled that resolution that you promised to do at the beginning of this year? Did you plan to save up to complete your studies? Get that Masters thesis done? Or resolved to start that exercise regime that you have been putting aside for so long? It's still not too late. You have two more months to go! 2013 is also a significant year for the company that I work for. This year, on 31 Oct, we will be celebrating the company's 180th anniversary! Yup, you read that right, it's 180 years old this year. Our company's history can be traced back to the colonial times, right up to 1833 when the first Superintendent of Public Works/Convicts was appointed by the British colonial government in Singapore. From then on, commenced the foundations of the infrastructural development upon which modern Singapore was built. 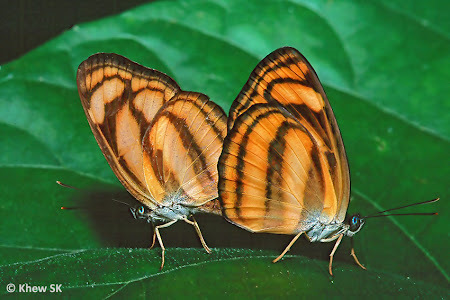 In a Sunday Times article today, the headlines read "More than 100 butterfly species extinct". Yes, it's quite true. Reference material and checklists from two main books - Butterflies of the Malay Peninsula 3rd Edition (1978) and 4th Edition (1992) by Corbet & Pendlebury (and updated by Col John Eliot) and Butterflies of West Malaysia and Singapore by WA Fleming, 1st Edition, 1975 and 2nd Edition, 1983, indicated that there were 386 butterfly species found in Singapore. Today, we have on record, 306 species, of which 37 were new records for Singapore. 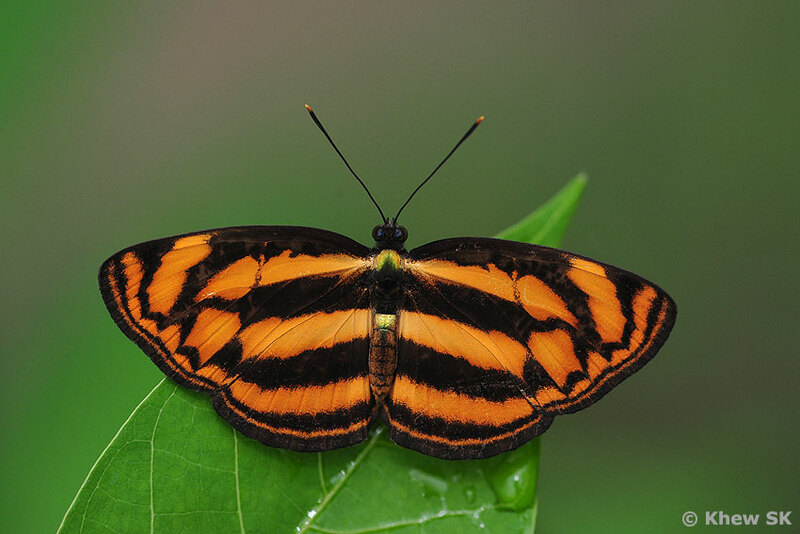 Hence of the original 386 species, only 269 have been traced today, suggesting that at least 117 may have gone extinct from Singapore. 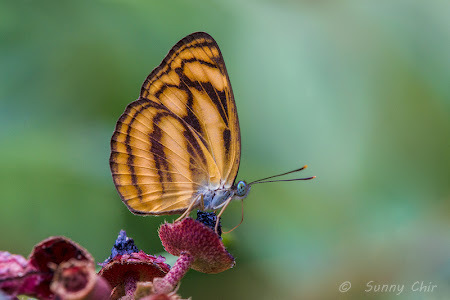 There are a few more species that are pending final identification that may bring the total Singapore checklist up to 310 or more, but these will be updated in a comprehensive revision at the end of this year. 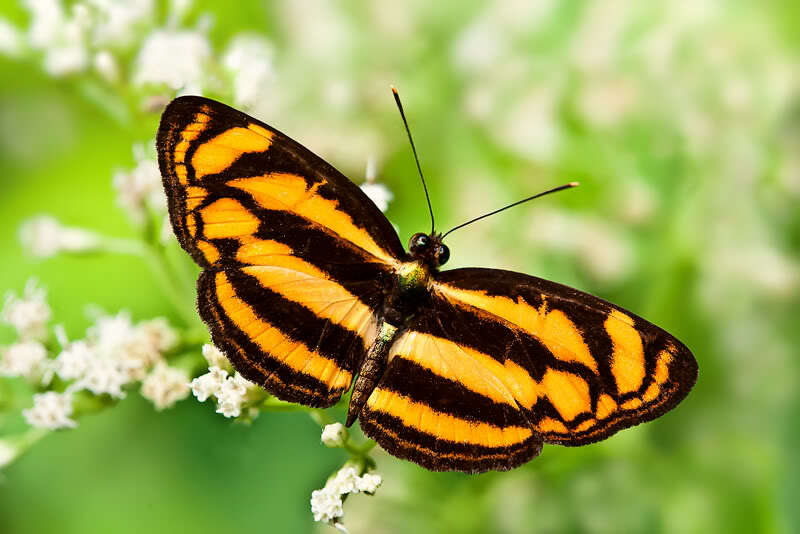 Even so, the notion that "more than 100 species may have gone extinct" in Singapore is certainly not far-fetched. 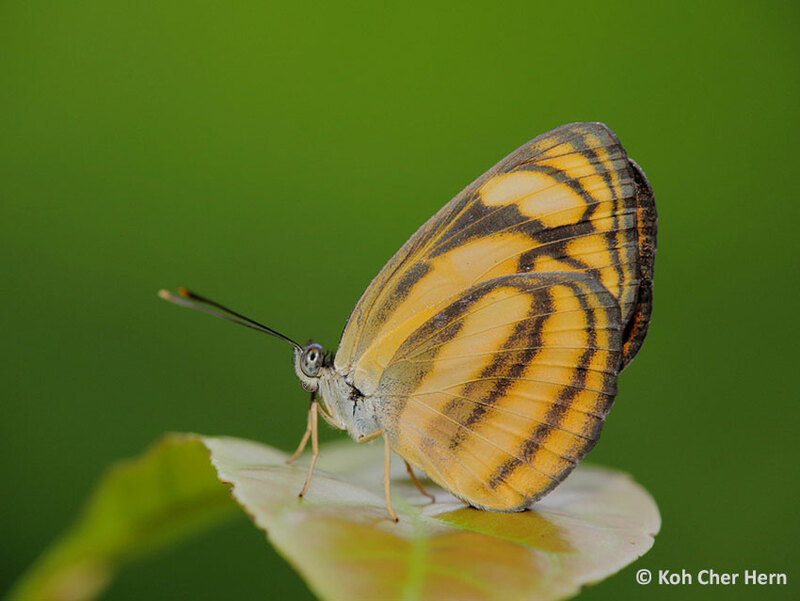 Whilst strategies have been proposed for the regeneration and the recovery of urban butterfly biodiversity, it is also at the same time, important to conserve the central core of flora in Singapore. It is predicted that at least 60% of our butterfly species in Singapore is forest-dependent, and once the nature reserves are affected, the further loss of the forest species may be irreversible. 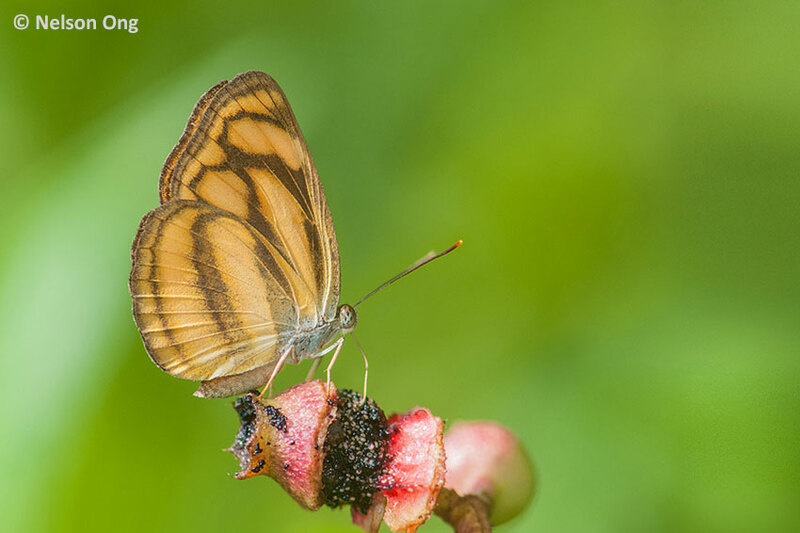 On the urban front, species that are found in parks and gardens may be given a leg up with appropriate planting and creating urban habitats that are conducive for the these species to recover their numbers. 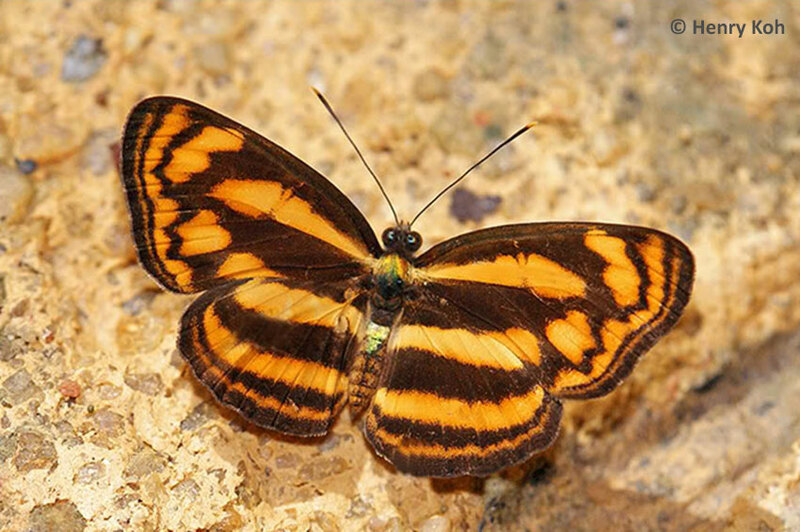 Our Butterfly for the month of October is the Malayan Lascar (Lasippa tiga siaka). This species one of four lookalike species found in Singapore that feature small. gliding butterflies with black and orange stripes across their wings. It is curious that its scientific name contains a Malay word "tiga", or "three" in it. Could it be because the author was making reference to the sub-marginal triangular spot in "space 3" of the forewing? This size of this spot is an important diagnostic feature that distinguishes it from the very similar looking Burmese Lascar. 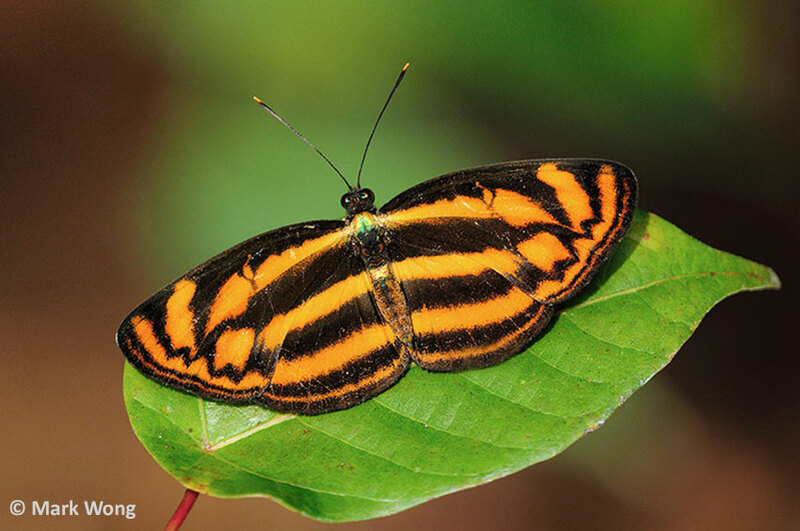 The Malayan Lascar is widely distributed in Singapore and can be found in forested areas of the nature reserves, as well as in urban parks and gardens. Although the species has a weak gliding flight, it is skittish and alert, often frustrating many butterfly photographers who are tracking it. When alarmed, the butterfly often heads for the tree tops and perch on an inaccessible leaf, looking down at the unfortunate photographer whose effort to shoot it has been in vain! However, the Malayan Lascar is often encountered feeding on flowering trees like Syzygium or the ripened fruits of the Singapore Rhododendron (Melastoma malabathricum) where the butterfly will be quite distracted whilst feeding, giving the photographer a much better chance at taking a good shot of the butterfly. The upperside of the butterfly features the typical orange/black horizontal bands across both wings, whilst the undersides are a paler copy of the upperside wing patterns. 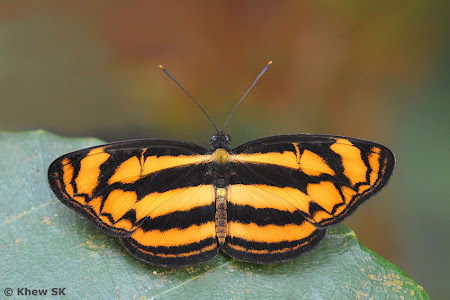 The characteristic triangular orange spot in space 3 of the forewing above, which is wider (often twice as wide) as the adjacent spots in spaces 2 and 4, sets it apart from it close cousin, the Burmese Lascar (Lasippa heliodore dorelia). 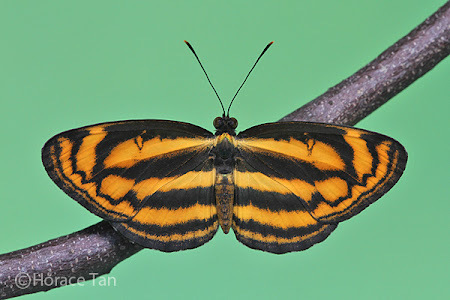 The Malayan Lascar is common, and sometimes several individuals can be observed at the same location, especially when they are feeding on flowers or ripened fruits. 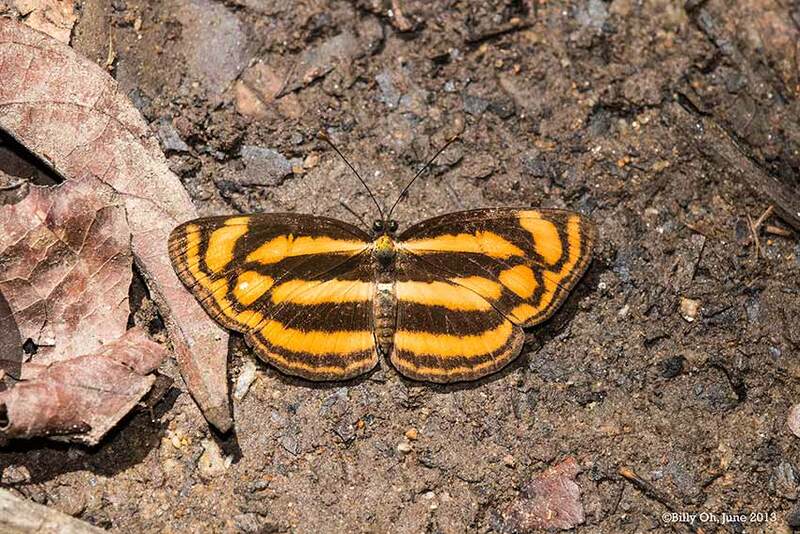 The species has also been observed puddling on damp sandy streambanks. The early stages of the Malayan Lascar has been fully documented here. 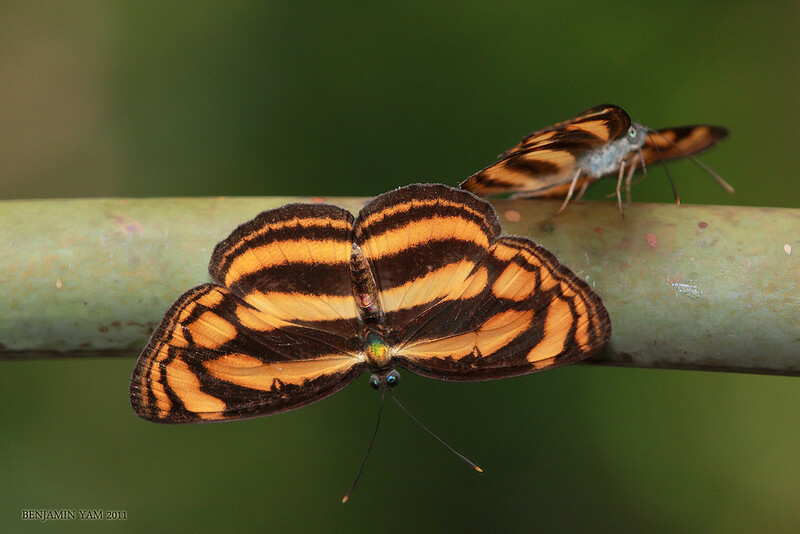 The caterpillars have been successfully bred on two species of host plants - Erycibe tomentosa (Convolvuaceae), Bauhinia semibifida (Leguminosae, Caesalpinodeae). Text by Khew SK : Photos by Sunny Chir, Khew SK, Koh CH, Henry Koh, Horace Tan, Mark Wong, Billy Oh, Nelson Ong & Benjamin Yam.